Larry D. Sweazy's See Also Murder was one of my favorite books of 2015. Now, he returns with a story that's even grittier, an atmospheric, richly detailed book out of the violent Depression years. A Thousand Falling Crows features lonely, lost people, in a time of desperation. It's a dry summer, one of many to come in North Texas, when Texas Ranger Sonny Burton encounters Bonnie and Clyde in his territory in June, 1933. He's sixty-two, still vigorous and in the prime of his life, but he loses a shoot-out with the criminals. Bonnie Parker shoots him, and he loses the use of his arm, and loses his career. And, nine months later, after his arm is amputated, he's suffering from "the thousand-yard stare" that fellow soldiers brought back from the Great War. He's on the verge of ending it all. But, just as that day changed his life, another encounter with robbers changes it again. Sonny drives his truck for the first time since losing his arm, and he's in a sad little grocery store when two desperate young men show up with guns. Sonny can't prevent the violence, and it''s only made worse when his son, following in family footsteps as a Texas Ranger, shows up. Sonny and Jesse never did understand each other, and Sonny's presence at that crime scene, and later crime scenes, only riles Jesse more. The 1930s was a violent time as desperate people robbed and killed for money. But, in North Texas, there's another killer, one who kills young women, brutalizes them, and dumps them on the side of the roads. While Sonny helps a father look for his daughter who might be mixed up with the grocery store robbers, local lawmen try to find the killer who seems to easily pluck his victims. And, the only witnesses are the observant crows, waiting for the blood they know a killer will leave behind. 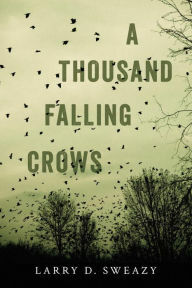 A Thousand Falling Crows is gritty with violence and the dusty atmosphere of North Texas.There's a strong sense of place, Texas after the end of Prohibition, but deep into the Great Depression, as people struggled to keep their homes, struggled to stay alive. It's a story of flawed, lonely, lost people, even some of the lawmen, even Sonny Burton. And, Sweazy's use of the crows as blood-thirsty watchers only adds to the menacing, moody tone of the book. Don't hesitate to give this to a reader who likes westerns or engrossing crime novels with flawed heroes. It's been ten years since I read Bob Fate's first violent story of west Texas and Oklahoma, Baby Shark. Although it was set in 1952, it had the same grim atmosphere as A Thousand Falling Crows. And, I can't give Larry D. Sweazy's latest book a greater compliment than to say it brings back memories of Bob Fate's gritty stories. Sweazy's book is just as violent and fast-paced, just as gripping. A Thousand Falling Crows is a richly detailed, engrossing story. A Thousand Falling Crows by Larry D. Sweazy. Seventh Street Books. 2016. 9781633880849 (paperback), 250p. Lesa, this is the kind of book I love--if it isn't very graphic in describing the violence. The west is good! No, not too graphic, Reine. The graphic details are from the crows' points of view.